For years, Goomi has been unleashing his own vision of Cthulhu upon the world, in his comic "The Unspeakable Vault (of Doom)!" Now his unique take on the Elder Gods comes to Munchkin, in the form of Munchkin Cthulhu 3 – The Unspeakable Vault. More Things That Put The Hurt On Monsters! Wield the Roman Candle, the giant Hypodermic Needle, and the... Can Opener? Sure, why not? This is Munchkin! 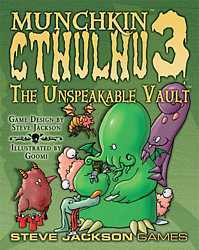 The Unspeakable Vault – more "yum yum" for your Munchkin Cthulhu game.